Cotton Kurtis looks so traditional and simple. It can be worn on all occasions. Try out these kurtis for those long summers. These are some cool cotton kurtis which can be paired with any of those trousers or salwars. These beautiful Indian cotton kurtis are everyone’s dream. The yellow kurti looks so pleasing and comfortable. It has three fourth sleeves with roll up tab features. It is made of 100% cotton. It’s easy to maintain. It comes with an inner lining. This double hemmed and curved at the bottom. It is an absolute delight to the eyes. They have a nice cotton kurti collection. Rolled hand sleeve gives formal look to girls, college going girls or those girls who like to use bike then they can try these cotton kurtis collection too. This white cotton kurta is a beautiful short top which can be work of jeans. This has a lovely chikankari work with a v neck with three fourth sleeves. It has a straight cut. The lovely blue thread work looks so gorgeous on the white top. This one is beautiful to wear in summer season or else you can use these type of cotton kurta designs for casual dinner or lunch parties. 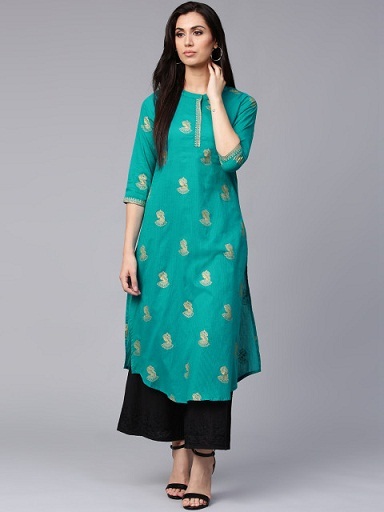 A nice jade green simple cotton kurti looks lovely on those pants. It has a notched round neck and the sleeves a little extended. The golden border work looks very attractive on this green top. It has contrast taping and can be worn on trousers. This is the best choice for a casual day in home, girls who love to use simple kurta at home in the evening then they can try this cottan kurti for regular use. This is a lovely cotton white kurta which can be worn on any salwar. It has an embellished detail and three fourth sleeves. The short button placket is beautiful. The thread work looks so traditional and nice. It has side slits. It suits all occasions. These are some simple cotton kurti designs. Mostly slim fit type of girls like to wear this style of white easy going printed kurti. This is a loose type material with proper stitching gives cool look while using this kurti for casual as well as regular wear. A lovely black printed stylish cotton kurti from fab India. This has a boat neck with side slits. It has three fourth sleeves which looks so simple and elegant. The design work on the kurti looks so fabulous. It could be worn an any black pants. 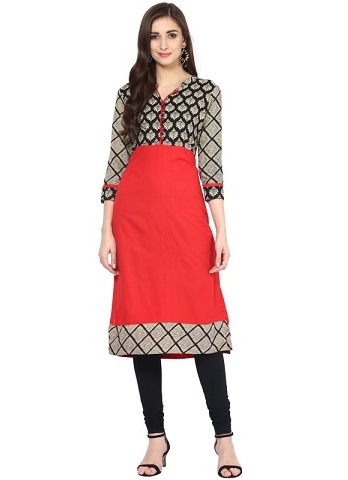 Every girl has its own personality some like to use tight wear or some lightweight easygoing material of kurti, this pattern is regular kind of material which is helpful for office or college wear too. This is a lovely grey and off white printed kurta. It has a boat neck and short sleeves. It has straight hem and front slits. The grey and white combination looks very cool, ideal for all casual occasions. Check out these cotton kurtas for women. These one prefer by mostly mid-aged women’s or those college girls who look good in this type of kurti pattern. These are lightweight so comfort in any season too. It is a pink embroidered a line kurti which has a mandarin collar. It has long sleeves and a long button placket. The work looks so beautiful. It is elasticated at the waist, a truly stylish design which suits all those party events. This could be worn on any of those pants. This is a beautiful cotton kurti design. Men’s who want to gift to their bride then this one will be a good choice to gift your sweet love. A lovely mustard yellow beige woven cotton kurti is simple. It has three fourth sleeves and a short button placket. It has a round neck and looks so elegant. The crochet detailing around the neck is ultimate. This is a nice cotton kurti which is suitable for casual wear. Those women who love to use kurta in a different pattern they also can try this type of kurta for their regular use, you all will get a good look at this style. You can hide your size by this pattern. This is a lovely blue cotton kurti. It has a mandarin neck and it is sleeveless. The light and a dark blue combination of the kurti is lovely. This could be worn on any of those pants. It has a short button placket. It looks cool on all casual events. Soch has ultimate cotton kurta design for ladies. Those girls who are lightweight then they also can try this type of outfit; sleeveless kurti will be good always for them. This one is a simple pink cotton kurti which is sleeveless. It has round neck and side slits. The color is very pleasing. It could be worn on any jeans. The lovely black flamingoes on the pink cotton printed kurti looks so cool. These are some latest cotton kurtis. This is best for college casual day use or for home use too. A red lovely printed woven kurti. It has three fourth sleeves and a short button placket. It has a vented hem. The lovely golden prints on the kurti adds beauty to the kurti, Looks so traditional. It suits all occasions. It is simple ladies cotton kurti. A teal green colour A-line kurta is so beautiful. It has three fourth sleeves and curved hem It has side slits. It is 100% cotton. The teal green looks so comfortable. It has a mandarin colour. The golden face motifs look so wonderful on this cotton long kurta. A beautiful pink embroidered kurta. This is a long kurta with three fourth sleeves and straight them. The Slit at the center gives a nice look to the long kurta. The thread work around the neck looks very beautiful. This one is a pleasing long kurta perfect for all occasions. A lovely yellow long kurta made out of cotton. The short has sleeves with cold shoulders. This has side slits with straight hem. It has a tying detail at the back. It looks cool on white palazzos. 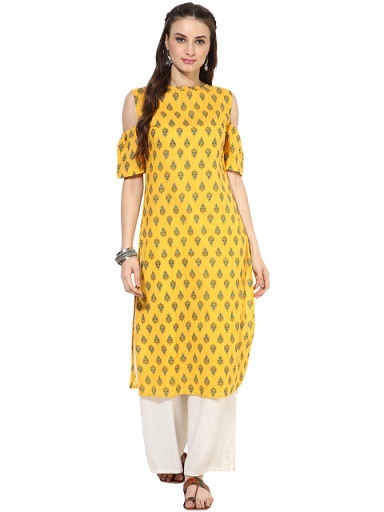 The simple prints on the yellow kurta add to the beauty. This is a green straight kurta which has mandarin collar with hook and eye closures. This has multiple slits with three fourth sleeves. It is a plain green lovely kurta which is so simple and elegant. The long button placket looks very stylish on this green long kurta. It suits all casual occasions. This one is the multicoloured cotton kurti for kids, this is totally sleeveless. This one is round neck kurti will be comfort to kid girls. This is ethnic wear type. Girl kids will enjoy this type of kurti as a gift too. Get this kurti for your girl. If you need classic type pattern in cotton kurti then this one will be a good choice for your kurti selection, full sleeve type jacket gives good support from sun rays while you plan for an outing in summer. Pair this kurti with stylish trouser or jeans too. The collar is totally Chinese style pattern. This one is best for casual type wear on summer days, fabric is pure cotton. You will get yellow coloured kurti with embroidered work. You can use this one yellow coloured kurta in your office too, take this one kurta for your regular fashion statement. If you want to buy something home wear regular cotton kurti, then this is the best blue colored full sleeve kameez type wear. It looks designer type of wear, plain work done with this type of long kurti. Cotton fabric has used for this long cotton kurti. This is useful for casual occasion. This kurti comes in all sizes and the pattern is totally plain. It has a 3/4th type sleeve. This kurti is skin friendliness and it comes in elegant different colours too. This is best for those women’s who works in the office, this is best as a party wear too. If you are looking short cotton kurti then this solid kurti will be a nice choice for your selection. It comes with rounded neck line and casual style in the pattern. This is totally regular fit so best for college girls too. It has a 3/4th sleeve, cotton fabric with solid design gives catchy look for women’s. This one red colored casual wear cotton kurti will be nice selection for casual seasons or casual functions too. Cotton is the basic fabric used for this kurti. Pattern is totally printed and different texture gives classic touch to women’s wear. This is useful in travelling outdoor station too, it helps to avoid more sweating during summer season. If girls are planning to buy cotton kurtas for the summer season or any other casual occasions then this combo selection will be great in low budget too. This one comes in mandarin collar neck type, sleeves are totally three quarter. The material of sleeves and material for lining are used by cotton only. Pattern is solid so fabric transparency is totally none. This combo will be a great choice in the summer season. More cotton kurtas for ladies are available in the market for festive season but this one angrakha style kurta will be passion for your fashion style. This is festive wear occasional kurta comes with 3/4th sleeve. Pattern comes in printed session as well as fabric transparency is zero. Cotton is the main material used for sleeves and it comes with V neck style type. You will not get attached sleeves with this but this one nice choice in red coloured kurta patterns. This one is the embroidered knee length straight cotton kurti which is useful to college going girls for their regular use. Teal green colour gives catchy look to this kurta, Resham embroidery pattern has used to make this kurta. It has a closed back style and fabric is cotton material. It has a V neck style pattern and knee length. This one straight style of kurti very useful for casual occasions too. A lovely set of cotton kurtis which can be worn on any occasion. Check out these nice kurtis from different brands and pick your kurtis depending on the size. It looks elegant and simple. 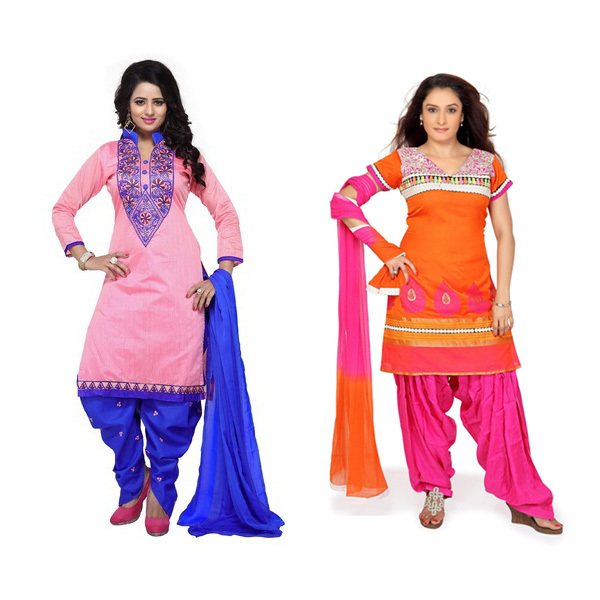 Cotton kurta designs for ladies are very comfortable to use and material is totally cotton. So, kurta in the cotton material will be a good choice for summer season too. When you plan to buy seasonal wear kurtis for your wife or your loved one then get cotton well designer kurta for them. 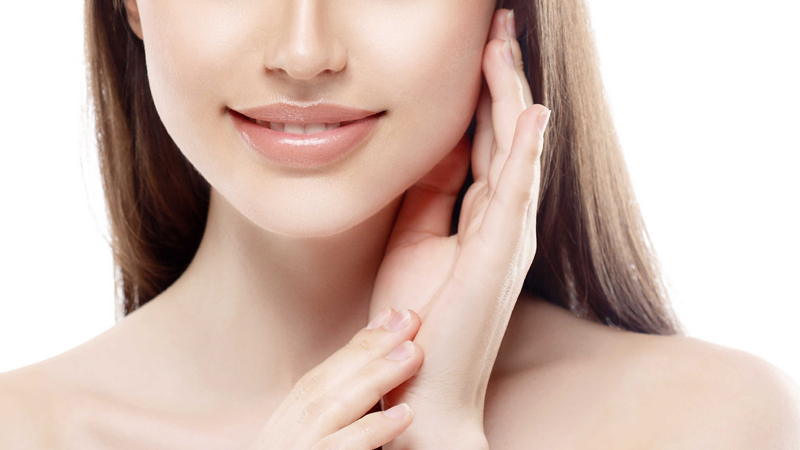 Womens love to try new fashions in their fashion style of patterns. Get some unique cotton printed kurtis to impress your friends or your dear one. You will never disappoint from your selection of cotton fabric material for kurta choice.